Francis Kéré, Office Kovacs, NEWSUBSTANCE, and other artists, architects, and designers have been chosen to bring creative and immersive installations to the Coachella Arts and Music Festival later this year. In years past, the festival has hosted an eclectic cohort of rising and established designers and artists, including Los Angeles–based Bureau Spectacular, Italian artist Edoardo Tresoldi, Nigerian-born, Brooklyn-based artist Olalekan Jeyifous, along with many others. This year’s slate of creatives boasts several new and returning acts, including artist Robert Bose, whose kinetic balloon sculpture was present at the 2017 festival. United Kingdom–based installation artists NEWSUBSTANCE are also making a return this year. 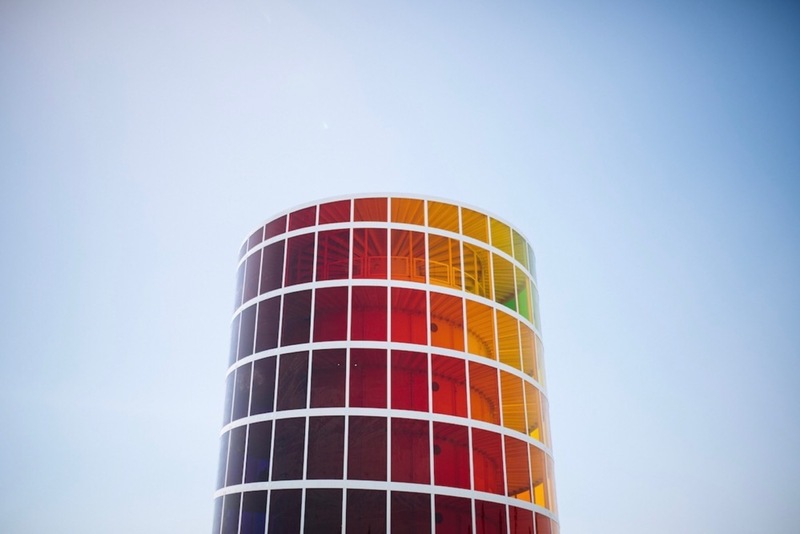 Their 2018 installation, Spectra, consisted of a seven-story sloping ramp tower wrapped in polychromic panels. Los Angeles–based Do Lab will also be participating again this year. The professional music festival venue creators have previously created installations for The Great Convergence at the Great Pyramids at Giza in Egypt, the Virgin Music Festival, and other large-scale events and music festivals around the globe. In 2018, Do Lab created a tent-like performance venue for Coachella that was fashioned out of yellow and blue triangulated panels. Absurdist art duo Dedo Vabo will also be returning to Coachella this year. In 2018, the team brought Corporate Office, a multi-story, LED-wrapped diorama to the festival. This year’s first-time acts are due to bring a breath of fresh air to the festival. Los Angeles–based Office Kovacs, helmed by Andrew Kovacs and Erin K. Wright, will be a part of the festival for the first time this year. Office Kovacs recently completed an installation at Woodbury University’s Wedge Gallery and also received an honorable mention designation for the Lima Art Museum New Contemporary Art Wing competition in 2016. Architect Francis Kéré will also be exhibiting his work at the festival for the first time in 2019. Kéré is currently working on a musical reflection pavilion for the Tippet Rise Art Center in Montana, among several other international projects. DKLA Design, a group of designers known for their life-like animal and abstract public art sculptures around the country, will bring their stand-alone pieces to this year’s festival, as well. Experiential designers Poetic Kinetics will bring one of their iconic works to Coachella. In 2016, the team partnered with the Architectural Association Visiting School Los Angeles (AAVSLA) summer program, the City of Los Angeles Department of Recreation and Parks, and the arts organization NOW Art L.A. to create Liquid Shard, a mesmerizing, iridescent wind-driven sculpture for L.A.’s Pershing Square park. Local artists Sofia Enriquez and Raices Cultura will also create installations for the festival, which takes place April 12-14 and again April 19-21. For more information, see the festival’s website.